The Coastal Change Forecast model predicts coast-wide levels of beach erosion, inundation and overwash based on Hurricane Florence's expected path and landfall and detailed information about beach elevation and structure. Credit: USGS. Public domain. Reston, Va. — Hurricane Florence, a dangerous Category 4 hurricane, is very likely to cause beach erosion along about three-quarters of the North Carolina coast as it makes landfall, and to overwash about 15 percent of that state’s dunes, with less extensive erosion in nearby states, say coastal change experts at the U.S. Geological Survey (USGS). However, the storm may cause continuing damage to Mid-Atlantic beaches and dunes if it moves very slowly after landfall, as forecasters expect. The USGS Coastal Change Hazards storm team is making two types of coastal erosion forecasts that, taken together, describe the range of effects that Florence may have on the coast. The first approach uses a computer model that analyzes coast-wide beach impacts to predict the probabilities of dune erosion and overwash for a wide area. The second approach, the Total Water Level and Coastal Change Forecast Viewer, is an experimental model that focuses on specific locations over longer periods, forecasting the timing and magnitude of elevated water levels at the shoreline. “Our forecast is for Florence to cause a long-lasting coastal erosion process with more than one set of impacts to the Mid-Atlantic beaches,” said research oceanographer Kara Doran, leader of the USGS Coastal Change Hazards Storm Team based in St. Petersburg, Florida. The USGS Coastal Change Hazards storm team is making two types of coastal erosion forecasts that, taken together, describe the range of effects that Florence may have on the coast. The first approach predicts the probabilities of dune erosion and overwash for a wide area. The second approach forecasts the timing and magnitude of elevated water levels at the shoreline in the Total Water Level and Coastal Change Forecast Viewer. The prediction of Florence’s effects at landfall are based on results of the USGS Coastal Change Forecast model, which has been in use since 2011, and is continually being improved. The Coastal Change Forecast model starts with the National Hurricane Center’s storm surge predictions and National Oceanic and Atmospheric Administration wave forecast models as input. The USGS model then adds detailed information about the beach slope and dune height to predict how high waves and surge will move up the beach, and whether the protective dunes will be overtopped, at high resolution for all the areas likely to be affected by storm-tides from Hurricane Florence. Because the projections are based on storm-surge forecasts, they change each time the storm surge forecast is updated. On Tuesday, the model forecast that as Florence crosses the coast, erosion at the bases of protective sand dunes is very likely to occur on 75 percent of North Carolina’s beaches, 53 percent of Virginia’s beaches, 36 percent of Georgia’s beaches, 29 percent of South Carolina’s beaches and 4 percent of Maryland’s beaches. Beach erosion is only the first level of damage a major storm can cause. As waves and surge reach higher than the top of the dune, overwash occurs, often transporting large amounts of sand across coastal environments, depositing sand inland and causing significant changes to the landscape. Overwash is currently predicted as very likely for 20 percent of beaches in Virginia, 15 percent in North Carolina, 12 percent in South Carolina, and three percent in Georgia. Inundation, the most severe impact, occurs when beaches and dunes are completely and continuously submerged by surge. Inundation is forecast as very likely for one percent of North Carolina beaches. The public can view a real-time map of these estimates on the USGS’ Coastal Change Hazards Portal (https://marine.usgs.gov/coastalchangehazardsportal). Emergency managers can use the coastal change forecast to help identify locations where coastal impacts might be the most severe, such as where roads will be overwashed by sand or where it’s roads might go underwater because of storm surge and large waves. 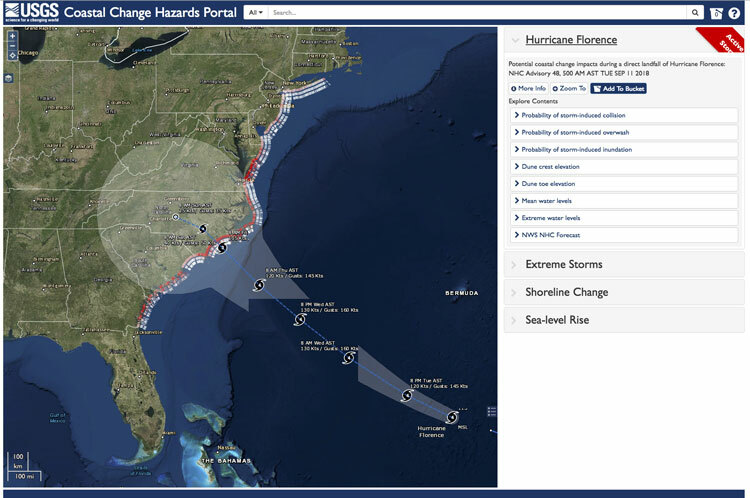 The most up-to-date forecasts for potential coastal change predictions are available on the National Assessment of Storm-Induced Coastal Change Hazards – Hurricane Florence page (https://coastal.er.usgs.gov/hurricanes/assessments/active.php). The Total Water Level Viewer shows changing water levels at specific locations – here, at Duck, NC – over time. Credit: USGS. Public domain. The Total Water Level and Coastal Change Forecast Viewer is a new predictive tool and is considered experimental. For that reason, it is not meant as a guide to making important decisions about protecting lives and property. However, its time-dependent outlook gives a fuller view of a storm’s long-range effects on coastal resources. While the final projections for Hurricane Florence will continue to change, Florence is forecasted to remain a powerful storm for several days and is likely to damage many parts of the Mid-Atlantic coastline.